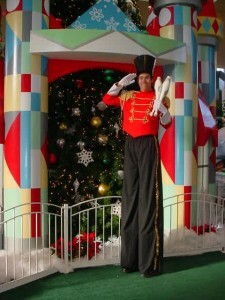 Lou Johnson's Stilt Walking Entertainment is something to see, his height on stilts is 8.5-9 feet tall. That means he can perform indoors as well as outside. No excuses. Carnival Barker and Top Hat and Tails are two of his most popular costumes and he has plenty more including Wizard, Court Jester, Uncle Sam, and Toy Soldier. Lou's own height of 6'6" allows him to be flexible to just about ANY space. Juggling and Flagging are included with the booking. Call to be added to the hundreds of satisfied clients including CHASE Bank and VERIZON Wireless! A kid at heart, Lou Johnson loves all the holidays; however, Christmas is his favorite. Each year thousands of people are entertained by Lou as the Tall Toy Soldier during Sayville, NY’s Miracle on Main Street and the Holiday celebration at the Tanger Outlets in Deer Park, NY. For years, Lou’s Magical Toy Soldier Show has been booked at numerous winter festivals and events, including Manhattan NY’s Nomura Group holiday parties. Contact Lou Johnson for more information for your next BIG event.